Organically grown. Innovative British chocolate. Free from gluten and soya. Free from colourings, preservatives & GM. Suitable for vegetarians.We like our Giant Chocolate Buttons to be the ultimate social chocolate. 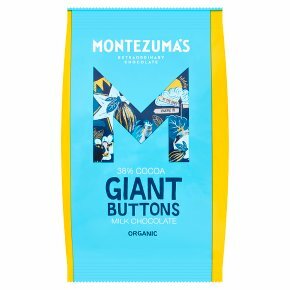 Spread around the joy of great chocolate in a button and don't be shy about offering them around, although you may want to hide half the packet first! All are fabulous and will make other more well-known buttons pale in their shadow.